TENA Fix pants are washable and reusable fixation pants designed to provide discreet and secure fixation for incontinence pads. The pants are designed to look and feel just like normal underwear, helping you manage incontinence with discretion and dignity. The product can be washed at 60 degrees in a washing bag, followed by gentle tumble-drying. 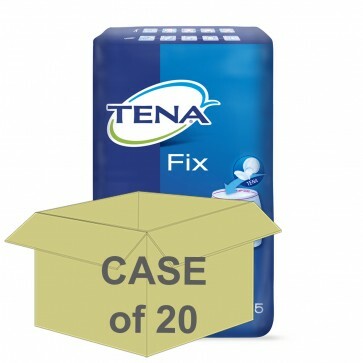 TENA Fix can be washed up to 50 times without losing its shape. TENA Fix Pants offer seamless comfort, the absence of stitching, seams and other pressure points to prevent skin chaffing and irritation. The soft, gentle material of the pants feel pleasant on the skin, ensuring you are comfortable and able to enjoy your day as if you were wearing normal underwear. The pants are latex free and are manufactured with polyester and elastane. TENA Fix Pants include colour coding and product information on the waistband of the pants for ease of use. The pants are latex free and have been dermatologically tested to ensure they will cause no irritation or damage to your skin.